Saturday, July 7 at 6 pm come on out to “Big Bottom” and enjoy some great sounds from one of the finest musicians to come from our area! 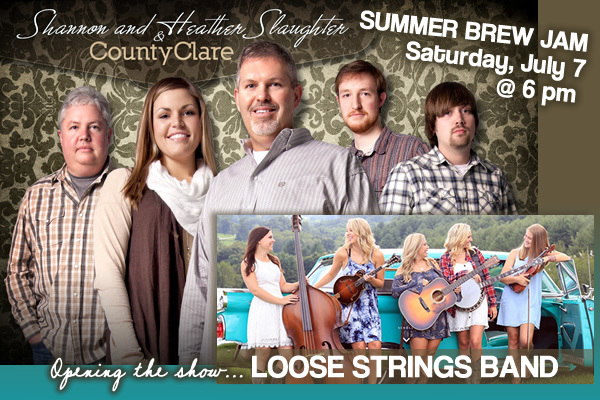 Shannon Slaughter, along with his wife Heather and County Clare have topped the charts and continue to woo crowds all over. The Loose Stings Band will be opening the show starting at 6 pm. Enjoy some smoked wings and some cold craft beer while you’re here! Advance general admission tickets are $10 and can be purchased at either Creek Bottom location, $12 at the door. VIP tickets @ $20 get you a reserved spot on the balcony, service with a smile & a free digital download if you get them early – $25 at the door for VIP’s.